All photos by Brian Mohr and Emily Johnson/EmberPhoto. Above: Skiing through a cave on day two. Is it possible to embark on a world-class skiing adventure right out our back doors here in Vermont? Last February, a crew of backcountry skiers from the Burlington, Stowe and Mad River Valley regions intended to find out. We were lucky enough to be there among them. Motivated by the abundant snowpack in the mountains last season, skier Dan Smith of Burlington (a mayoral candidate in 2009) couldn’t get the idea of a three-day, descent-filled backcountry ski tour out of his head. The tour would take us from a friend’s home in Bolton, to another’s near Moscow, and then to the Smith family’s cabin in Underhill — before skiing over Mansfield and back to Moscow again. Our friend Mike Welch of Moscow put things in perspective a few days before setting off: “Why head to British Columbia when we’ve got some of the best snow in the country right here?” That Canadian province offers some of the world’s best hut-to-hut skiing opportunities. 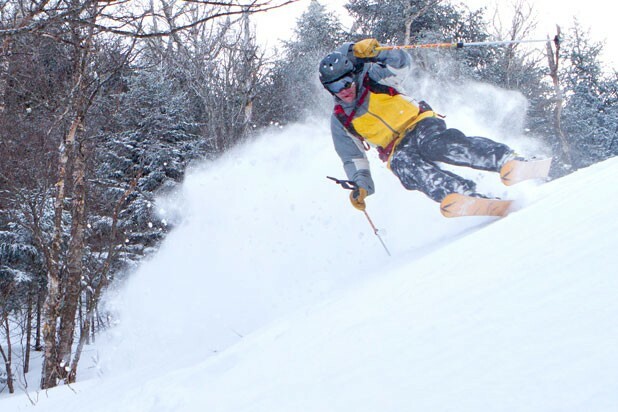 No doubt about it, last year’s ski season was one for the record books — one that Vermont snow lovers, at least until last weekend’s snowstorm, have looked back on wistfully. Our group of skiers included Smith and his fiancé, Lindsay Peet, along with nearly 10 other friends, male and female. 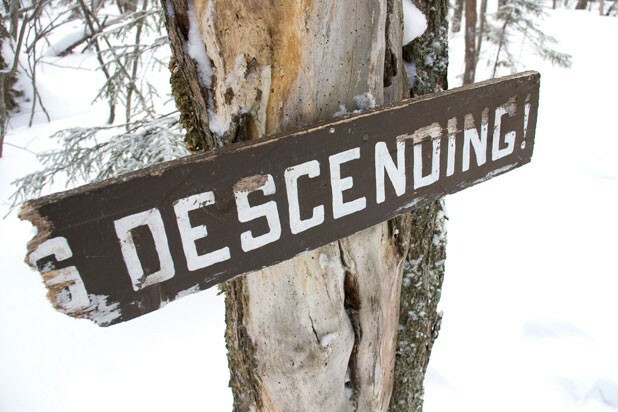 After skiing away from Scott Fleckenstein’s Bolton home on day one, we proceeded to climb — using climbing skins — and then enjoyed five powder-coated descents through and north of the backcountry near Bolton Mountain. Above: The climb is always worth the reward. Below: Got powder? Just before dark we arrived at the Moscow home of Welch and his wife, Sarah Nestor, who would host us that night. We were tired and eager to eat, hydrate and get a good night’s sleep. Several local friends dropped in for dinner and the camaraderie. A light snow was falling outside. Kevin Thompson of Waterbury exclaimed that he couldn’t wait to get up the next morning. It was unclear whether he was more excited about the skiing to come or the delicious breakfast that awaited us. On day two, we crossed to the west side of the Green Mountain Divide and logged five more memorable runs. We spent the day skiing under the canopy of the hardwood forest, climbing through ice-riddled stream gullies, discovering rocky caverns and occasionally stopping to share food or enjoy the view. The route combined terrain that some of us knew well with a few areas that none of us had yet explored. We spotted partridge, snowshoe hare and moose tracks. As darkness fell, we arrived to fresh snow on the porch of our cozy Underhill cabin. And once again, we were hungry. More friends joined us for dinner here, and then we prepared for an early start to our third and final day of the tour. The forecast called for snow, sleet and high winds, and a possible changeover to rain the next morning — exciting conditions for crossing the summit of Mt. Mansfield. By late morning, we were descending the mountain atop a fresh coat of sleet-infused powder, via the historic ski trails of the Ranch Valley near Stowe. The skiing was fast and fun. Only one more climb remained before our final stop back in Moscow. Will the snow gods bless us with enough snow to pull off another, even longer, tour this season? Last weekend’s abundant snowfall in the mountains was a very good sign. Let’s hope it keeps up. 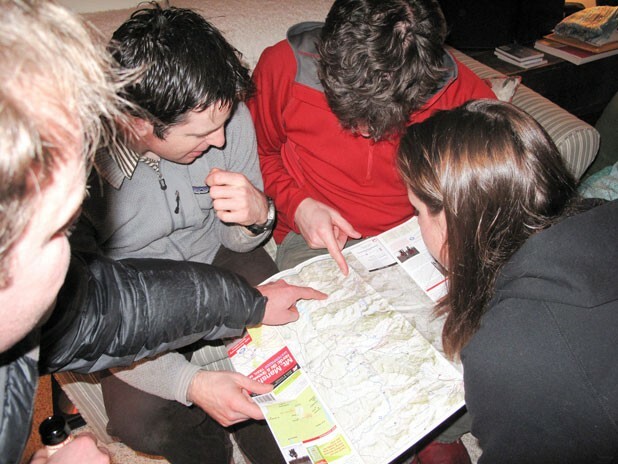 Above: Poring over the map after day one.